God’s heart is expressed in the perfect sacrifice of His Son, Jesus, on our behalf. Though Christ’s death, burial and resurrection make up the cornerstone of the Christian faith, many people forget the meaning behind His birth. 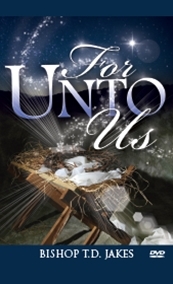 In For Unto Us, Bishop T.D. Jakes paints an accurate portrait of Christmas and the motivation behind the arrival Christ on the earth. The life of Christ is one that should be studied the entire year. Whether you are reflecting on Christ’s birth during the Christmas season, or if you are simply studying God’s Word during your private time in His Presence, this message is timely and will serve to increase your faith. Make it a part of your personal ministry library today, and discover the beauty in God’s plan in coming to earth to redeem His children.